I chopped an onion, some bell pepper, and celery: now what to make? 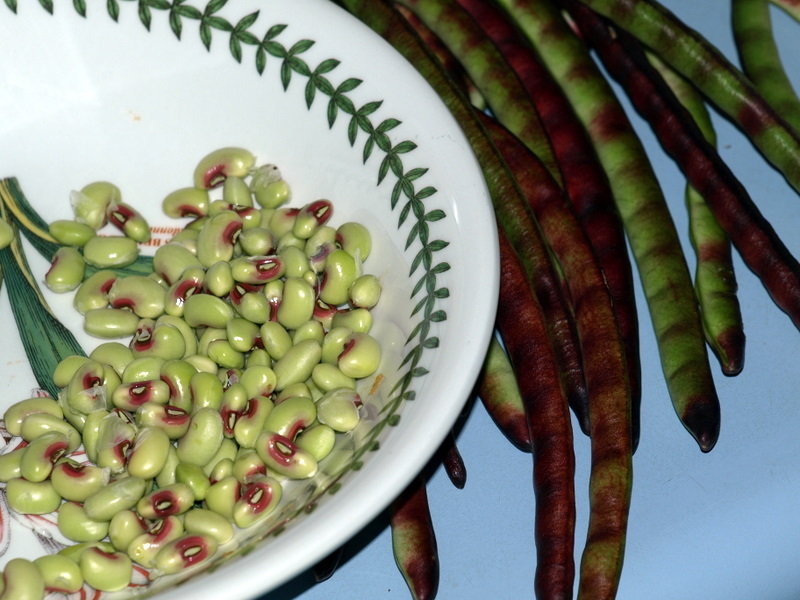 When I started chopping, I had every intention of browning those aromatics as the first step toward trying out a red-beans-in-the-slow-cooker recipe, but after two days of the chopped onion stinking up my refrigerator, I didn’t feel so “red-bean-y” anymore. Meanwhile, the onion continued to taint my ice cubes with a faint aroma, I had a handful of purple hull peas withering on the counter, and tomatoes crowded every flat surface in the kitchen. Hmmm…peas, chopped trinity, and fresh tomatoes. Add a little chicken, a roux, and voila: a chicken pea-casse. Like fricasse, but….you guessed it….with fresh peas. 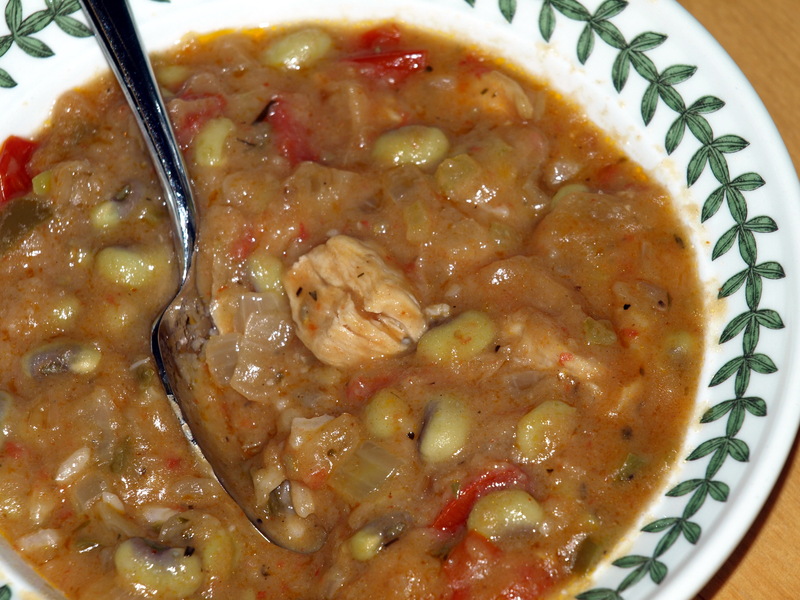 It’s a close cousin to the usual Cajun favorite of stewed chicken and fresh baby lima beans. In a deep, wide skillet, heat peanut oil or bacon grease over medium-high heat until a pinch of flour sizzles when sprinkled in. Add flour, stirring to combine. Reduce heat slightly and cook roux, stirring almost constantly, until it is a thick medium brown (or make it as dark as you like). Add chopped onion to browned roux; stir until onion is wilted and brown around the edges, then add celery and bell pepper. Continue to cook, stirring often, until vegetables are soft, then push them to one side of the skillet. Add chicken; allow it to brown before stirring. When chicken is lightly golden on most of its surfaces, add fresh peas, broth, chopped tomatoes, bay leaves, cayenne, thyme, parsley, and worcestershire. Ingredients should be just submerged in the liquid; if not, add just enough water to cover. Bring to a boil, then reduce heat to a slow simmer. Cook for 30 minutes, then add chopped green onions. Continue cooking to achieve desired thickness. Serve over hot cooked rice. *Using 2 chicken breasts makes this dish meatier, with the peas serving as a background note. Of course, you can use bone-in chicken; simply brown chicken pieces as described in the recipe and add 15 minutes to the cooking time. Remove cooked chicken from the dish before serving, debone & separate chicken into bite-sized pieces, and add deboned chicken back into the dish.